**UPDATE: IndyGo is no longer offering commuter bus service to Carmel and Fishers. The Central Indiana Regional Transportation Authority and Miller Trailways have teamed up to offer a similar service. Details are here. Catch the bus: Meijer Store along North Pennsylvania Street at West Carmel Drive. Park in the designated area at the northwest corner of the property. Times: The first pick-up is at 6:15 a.m. at the final drop-off is at 7:25 p.m. Cost: One-way bus fare is $2. More details: Single Ride Passes may be purchased online at www.IndyGo.net, or in person at the IndyGo Customer Service Center located in the Indianapolis City Market. Passes are also available by calling (317) 635-3344. This information is now outdated. The Indy Express Bus from Carmel and Fishers is operated by Miller Trailways and the Central Indiana Regional Transportation Authority. 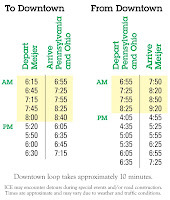 For schedules, fares and more details, visit http://www.cirta.us/Default.aspx?PageId=33&LinkLevel1Id=46.